Some of our most notable names include Albertsons, Anna's Linens, Dollar General, Fred Meyer, HyVee, Ingles Markers, Jewel, Kroger, Meijer, Rite Aid, Spencer Gifts and WalMart. And from Jack’s 99ç Store in the heart of Manhattan to Spencer Gifts in the Stratosphere Las Vegas, there are thousands of retail outlets that carry the Gonesh brand. It doesn’t stop there. Gonesh is sold internationally as well. From London west all the way to Tokyo and Hong Kong and almost everywhere in between, Gonesh can be found in a variety of retail environments. Even WalMart carries Gonesh in Canada, Mexico and Hawaii. To top it off, we’ve shipped Gonesh to more than 40 countries worldwide. 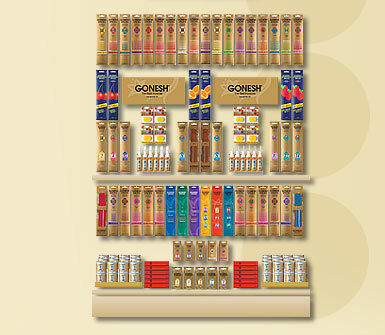 From Panama to Argentina and Portugal to South Africa, Gonesh continues to grow in world popularity. If you want to know where to buy it in your neighborhood, just contact us.